The Cuts : The Gravy Train – Cronyism and Incompetence in LA’s? In a comment on our post on events in Haringey Justin Wylie argues that the young people’s questioning of the consultancy fees paid to an interim Director exposes an oft-ignored dimension to the claim ‘we have to make the cuts, there’s no option’. While the authority is planning to cut a youth service it is paying a consultant (according to the young people) £450.00 per day. All this rhetoric about “we have to make cuts because the grant is being cut” misses the main area where savings can be made in local authorities. Incompetent management and absurdly over-paid external consultants as well as corporate suppliers who over-charge. I tried to check on the £450.00 reported fee for the interim head of youth services in Haringey. I couldn’t check that but on the Community Care magazine jobs board I found an advert for the Interim Director of Children’s services somewhere paying £650.00 to £750.00 per day. The post is offered for 6-9 months. That is up to £106,000.00 for the nine months. This appears not to be unusual. 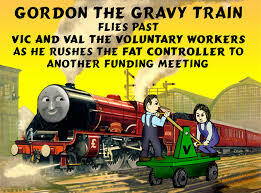 In a blog in early January Justin draws our attention to a situation in Buckinghamshire, which, he argues, illustrates a disease at the heart of local authority life, the ‘gravy train’, “a feeding trough for private individual and corporate greed. This is why the Trade Union campaign against the “cuts” is so unconvincing. No one – neither central government nor the Unions – can mention the real elephant in the room. Local authorities are run by managerial incompetents whose main talent frequently appears to be to shuffle vast amounts of public money off to profit-making firms often run and owned by people who only last week were employees in the public sector. These firms often produce sloppy and second-rate services and products in return. Local authorities should be obliged to develop in-house services and not contract out. In areas where there is a natural monopoly such as the provision of IT services to local authorities a nationalised industry should provide the service and councils should be obliged to use them. Managerial employees in the public sector should not be able to leave and immediately use their sector knowledge (gained at public expense) to enrich themselves. In any other country this would be called graft. These measures would reduce the budget of local authorities. The services wouldn’t be any worse. That would be impossible. Read in full at The Cuts missing the point. At last a defence of the ‘Youth Service’ which would make sense to many Group Scout Leaders. Justin s comments ring true. Though, I’d object to LEAs not contracting out to voluntary youth organisations, I see no reason for councils running activity centres or youth hostels in competition to scout activity centres or the youth hostel association. The highly paid management apparatchiks really are the worst possible representatives for the grass roots youth worker and really alienate volunteers who are struggling to run their entire project on what it costs to pay a youth services manager for a week. Yes. Good point. I didn’t mean to suggest not contracting voluntary organisations to provide services. In fact I think this is the way to go. One of the problems is that I get the impression to get the funding you have to demonstrate “outcomes” that will meet the corporate goals of the local authority, with the inevitable danger that you become like the local authority. I guess the way to deal with this is to have someone who acts as a front to the LA – telling them what they want to hear. While “behind” that screen you get on with your vision for youth work. This ties into TT’s questioning of the “ethics” around “proving” that you have met outcomes of course. Not suggesting that Voluntary organisations could take on all the roles of the youth service, Just that there are some services we already provide that LAs could use. For instance why are local authorities running their own outdoor activity centres instead of investing in scout activity centres surely a partnership would free up resources for the services core priorities ? Similarly the scout association have a huge number of buildings which altough in need of modernisation are often in locations where there is no other youth provision a decent partnership agreement could make those sites available to detached teams, drop in clinics etc. Would a ‘verifiable educational outcome’ be what scout leaders would call a badge ? Yes. Of course a balance would make sense. I am just trying to exclude corporate suppliers from the game. I suspect but don’t know, that a Scout badge would not count as an educational Certificate in the same way that say a certificate (however easy to obtain) in IT would. Thus it would not count as an outcome. An “outcome” is something that is imposed from on top in a hierarchical way. (That’s why outcomes are incompatible with youth work). I found when looking into funding for a small voluntary sector youth project a while ago that it would help to present the project as reducing crime. (Reducing crime is an outcome). That said I doubt there is a youth project these days which doesn’t claim to “raise self-esteem” and “increase self-confidence”. So maybe Scout badges can be presented in this way? I don’t suppose you have to believe it. Just to add to this theme. The Chief Executive of Oxfordshire County Council is departing. Her leaving package is reported to be £600,000.00. http://tinyurl.com/qzowurp This is made up of a pension pot of £423,000.00 and a severance bonanza of £151,000.00. As a point of information the maximum requirement for statutory redundancy is £14,000.00. I don’t know the details. Maybe her contract specified that she was entitled to her ongoing pension payments even is she was made redundant. Though, then, the question would be why was this made into the contract. Ms Simond’s leaving package then amounts to 25% of the cuts to the Youth Service. Here is a suggestion. Pay Ms Simons the legal requirement (no more than £14,000.00) and restore up to 10 youth workers in Oxfordshire. I fail to see why these obvious savings cannot be made. + The Council is making the usual excuse; this will save up money in the long-term. Talking about the long term the saved £586,000.00 would still pay for one Youth Worker for ten years. Further confirmation today of the Haringey situation. Thanks Tony. That’s interesting. It seems like quite a lot of money to me. As far as Buckinghamshire goes. The “Integrated Children’s System” and event reporting IT system appears to have cost £373,000 00. I’ve no way of assessing whether that is value for money but I note that this is a system which presumably every LA Children’s Service will require. And it will be exactly the same set of requirements. If there are 34 Upper Tier authorities and they all bought the same system the total cost to the public purse would be: £12 million. An IT system which can’t be much more than a database and reporting system cannot cost that much to produce. This would support my argument that the way to stop the local authority overspend on IT systems would be to have them all supplied by a single, nationalised, supplier. The argument that the private sector provides best value for money is clearly fallacious. I am having deja view of the privatisation campaigns of the eighties. At least part of the IT system in Buckinghamshire was supplied by a company called LiquidLogic. I traced them back and discovered that they are ultimately owned by a private equity US firm. These firms are (increasingly) buying up companies in the UK and using their expertise in pricing models etc. to squeeze more revenue out of them. This is just one example but I would be confident it is not atypical. So. Where is the money going which could be going to the youth service? 1. Extraordinarily lavish golden goodbyes for Chief Executives. The system is clearly awash with money. It just isn’t getting to the Youth Service. I would also add that the same consultation at Haringey previous to this had a ssimilar position in Havering! The Integrated Children’s System and event reporting IT system used in Buckinghamshire cost the authority an initial capital sum of £373,000 00. IF (and it is an assumption) they sold it at the same price to each of those 50 local authorities that makes a total cost to the taxpayer of £18,650,000.00. There is no way that the system, which appears to be a relational database system with a web interface will have cost that much to produce. This would appear to represent a potentially huge profit for the US private equity firm who owns the supplier. What I’m getting at is that the system whereby local authorities purchase products and services on a commercial basis creates opportunities for huge revenue streams for commercial companies (in this case a US equity firm) but is anything but a good use of limited public funds. The system operates so as to benefit the balance sheets of commercial companies (in this case US finance capital); definitely not the “service user”. If this system was supplied by a nationalised industry at cost perhaps the real cost would be £2,000,000.00. The difference, the surplus profit, currently going to a US private equity firm, could be used for actual social provision. Just asking for “less cuts” without addressing systemic problems like this does not get to the root of the problem. There needs to be a more insightful and politically aware campaign that shows people where the money is going and how the provision of public services is being abused to enrich finance capital. Just to add. Following press reports of a £600,000.00 pay-off to the departing Chief Executive of Oxfordshire County Council I did a Freedom of Information request to find out how this was arrived at. In fact Joanna Simons is to stay after all. However, this did turn up some interesting information. Oxfordshire County Council (which cut £2.3 million from its Youth Service budget) pays staff who are made redundant 1.5 x their salary at leaving. So, for example, the Chief Executive is paid £186,000.00 per year. So, if she is made redundant the package will include £279,000.00 redundancy. The maximum statutory amount that the Council is required to pay is no more than £15,000.00. This means that, had she left the Council would have paid her £264,000.00 of public money over and above what they are legally required to do. In an attempt to justify their self-indulgence Oxfordshire County Council has researched figures for how other local authorities behave. It seems that 89% of authorities use actual salary calculations. Though the multiplier may be different. Only 4% use the statutory minimum. If two or three senior staff leave in a year the local authority will be paying out hundreds of thousands of pounds which they have no legal requirement to do. These are significant sums of money which would make a difference to budgets. Certainly there is a narrative about cuts. But there is money in the system. (A point which can be made irrespective of the cuts).